Trumpeter Kevin Cobb was born in Bowling Green, Ohio, and made his first solo appearance at age 15 was with the Toledo Symphony. 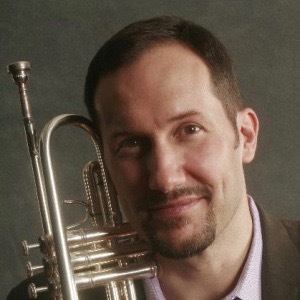 He joined the American Brass Quintet in 1998 and has been an active performer with many of New York’s leading music organizations including the Metropolitan Opera, New York City Ballet, Chamber Music Society of Lincoln Center, Orpheus Chamber Orchestra, and Orchestra of St. Luke’s. He can be heard in radio and television commercials and has recorded more than 10 CDs with the American Brass Quintet alone. His first solo CD, One (Summit Records), features an all-American program of unaccompanied trumpet solos. Along with fellow trumpet player Brian McWhorter, he co-hosts the Integral Trumpet Retreat that illuminates an alternative view of making music on the instrument. Cobb is co-principal trumpet of the Aspen Festival Orchestra as a part of the Aspen Music Festival and School. He has been on the faculty at Juilliard since 1998 and on the faculty of the school’s Pre-College Division since 1999. He also teaches at the State University of New York—Stony Brook, and at the Hartt School. He attended the Interlochen Arts Academy where he studied with John Lindenau, received his BM degree from the Curtis Institute of Music where he studied with Frank Kaderabek, and earned his MM at Juilliard where he studied with Mark Gould. He has also studied with Martin Porter and John Aley.